Crystal Vision's products are individual cards that need to be housed in rack frames. Vision 3 is the rack frame for the Vision product range. 3U high and holding up to 20 cards, Vision 3 is suitable for higher bandwidth signals such as IP and 4K as well as SDI video and audio. 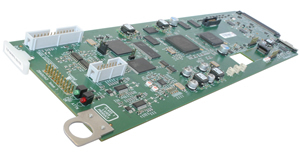 With features such as dual syncs distributed to every card and fast internal and external communications, this forward-looking frame system offers numerous outputs and includes both power supply redundancy and complimentary SNMP as standard. A different frame system is available for the Indigo range of products. Vision 3 is a forward-looking platform suitable for IP and 4K as well as SDI video and audio products. In essence Vision 3 makes Crystal Vision ready now for the coming technologies that will change the broadcast industry over the next few years. Systems that have Vision 3 frames can cost even less than equivalent Indigo systems. Vision cards are cheaper, the common frame reference results in simple wiring and less analogue distribution amplifiers, the high packing density means systems will use fewer frames and the extra outputs will reduce the number of cards and DAs required. If you're planning an installation that will include IP and 4K or your SDI installation would really benefit now from features such as the dual syncs or the extra outputs, you should choose the Vision frame system. If you want the biggest range of boards (including chroma keyers) and a choice of three frame sizes, then you should choose the Indigo frame system instead. Vision 3 will save you rack space: it can house 20 vertical cards in 3U. Crystal Vision's frames have always offered a high packing density, but Vision can house two extra cards in the equivalent Indigo space. The cards plug in from the front, just like Indigo, and can be removed while the frame is powered. The only positioning restriction with Vision 3 is that dual slot cards cannot straddle slots 10 and 11. When used with a dual slot rear module, a Vision card must sit in the right hand slot of the rear module as viewed from the front of the frame. Two designation strips (located at the bottom of the front panel) allow the easy addition of helpful notes about that frame's contents, allowing you to identify which cards are inside the frame without opening it. 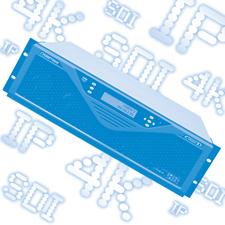 Ideal for your transition through a range of technologies, you can mix any cards from the Vision range together – whether analogue audio, digital audio, SD video, HD video, 3Gb/s video, DVB-ASI or video over 10Gb/s Ethernet. Vision 3 can be used with higher bandwidth signals (such as 4K and 10Gb/s IP) because signals go directly between the Vision rear modules and the cards without having to pass through a full back plane. To access the signals on the Vision cards you need rear modules (VRs), which plug into the back of the frame. The number of outputs you get is determined by which rear module you choose. Crystal Vision offers a wide choice of these VR rear modules which offer varying numbers of inputs, outputs and loop-through options along with the choice of BNCs, Micro BNCs, D-Type and dual LC fibre connectors. The Vision cards allow up to seven BNCs in a single slot and therefore provide extra outputs compared to their Indigo counterparts – providing more signals for you to use and cutting down on the requirement for DAs. Each rear module has a selection of labels suitable for different products. 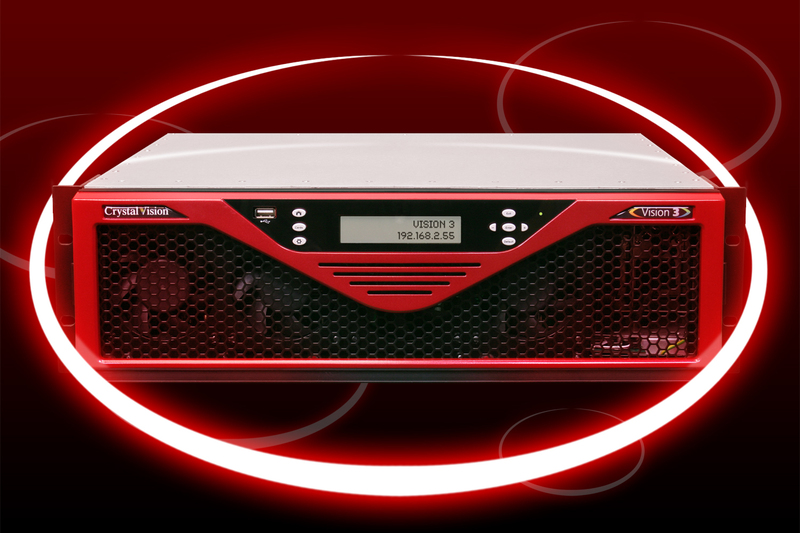 Power supply redundancy comes as standard on Vision 3 – providing extra peace of mind for those working live. The Vision 3 frame is supplied with two very reliable 460W PSU3-VF power supplies, which provide sufficient power for any combination of cards in the frame. Having so much power available allows us to put more functionality on each card. The frame will run normally on a single power supply but two are provided such that the frame will continue to work should one fail. The power supplies are fitted with an internal fan; the speed of these will vary according to the load and ambient temperature. The power supplies are easily accessible should they need to be changed and can be removed and reinserted without powering down the frame. Vision's exceptional cooling system means any cards can be combined in one frame. There are four cooling fans mounted on the front panel and two fans on the frame CPU. The two power supplies also have their own built-in fans. The ambient operating temperature for Vision 3 is 40 degrees Celsius. The frame should be operated with the front panel shut to prevent overheating, but the front panel can be opened for short periods to perform tasks such as changing cards or power supplies. The front panel fans will operate at two speeds, either normal mode or fault mode. In normal mode the speed will be sufficient to keep the frame cool under normal operating conditions. If a slot or frame processor temperature exceeds 65 degrees Celsius, if a fan fails or if the frame front panel is left open for more than 45 seconds, then fault mode will be activated. The frame should continue to work reliably if one of the six frame fans fails, although the faulty fan must be replaced as soon as the frame can safely be de-powered to do this. One of the most useful features to be found on the Vision 3 frame is the common dual reference. The advantages of having common syncs to the frame include less wiring, a spare BNC on the rear module for other signals (meaning more outputs!) and less sources of syncs required (meaning less DAs). It provides peace of mind for keeping those 20 cards on air. All in all, it’s a huge benefit for our products that require reference timing – from SYNNER-VF to UP-DOWN-ATXS-VF. The references are connected to two independent BNC connections on the rear of the Vision 3 frame, with each reference input distributed to all 20 slot positions. If a card has no use for a reference, it just ignores it. On Vision cards that get their timing from PTP, the PTP is input into the card via the 10GbE link. On Vision cards that lock to an external reference, the timing source is selected using the VisionWeb web browser control software from a PC, tablet or phone. Typically if there is a failure of the reference in use, the next on the list will be selected. If you select Ref 1> Ref 2> Video > Freerun, for example, then Ref 1 is considered the main reference, with Ref 2 used if Ref 1 is absent or invalid. If Ref 2 also fails then the video input itself would be used as the reference, followed finally by freerun to produce a valid output in the absence of neither video nor reference. There are two main applications that benefit from these dual syncs. Firstly there's the engineer who wants to achieve maximum system reliability by providing main and backup sync distribution throughout the facility. The syncs will be identical and signal path equipment will use the main syncs as long as they are valid; should the main syncs become invalid, the signal path equipment will automatically switch to the backup syncs. Alternatively there's the facility which uses two reference syncs (featuring different timings, different standards or different frame rates), with the engineer telling each piece of signal path equipment which sync source it has to use. 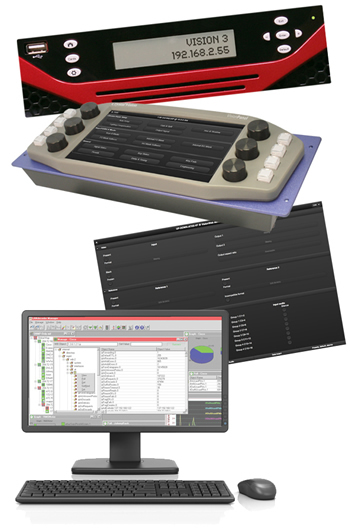 Vision 3 offers customers different types of control to suit all preferences. The Vision 3 frame includes an integrated control panel with LCD display which provides inexpensive monitoring and control of every card in the frame. VisionWeb Control is a free-of-charge way of operating the Vision products from a web browser. VisionWeb uses a card's XML control interface, which is stored in the Vision 3 frame's CPU card. To access the control menus, the operator simply types the IP address of the frame into a web browser running on any device that is connected to the same network. Up to 16 of the frames can be controlled by a VisionPanel 3U touch screen control panel over Ethernet. Cards and frames can be controlled and have their status reported using SNMP, which is included for free in the Vision 3 frame. SNMP traps can be used to trigger alarms – such as when a signal has been removed, video standard changed or any of the many monitored status variables changed. With Vision 3 frames it is possible to password protect different levels of access to frames and slots. The Vision 3 frame includes two 1Gb/s Ethernet connections to the outside world for control and file transfer. This allows you to either have a redundant control path (to protect against failures in your system) or alternatively to have a segregation of control schemes, for example, SNMP on one and operator control on the other. The Ethernet connections also make it easy to update the card software via the frame CPU's Ethernet without having to make a physical connection to each card – saving so much time. There is one LED on the front of the frame, which will normally be green but will light red if there is a front panel fan fault, a PSU or PSU fan fault or the temperature of a slot exceeds 65 degrees Celsius. Please note that Vision 3 does not offer control by Statesman, Statesman Lite, GPIs (at the present time) nor board edge switches. Frame software version 1.5 added flexible security to the Vision frame, with the ability to switch off services that are not required. It is now possible for a user to disable all services except ping in order to prevent unwanted access to the frames. SSH, FTP, HTTP, SNMP and ASCII can all be disabled. It is also possible to remove the Network Configuration, SNMP Configuration and Software Upgrade menus, should this be required. Restricting access to the frames is particularly useful in large installations where many people have access to the control network. 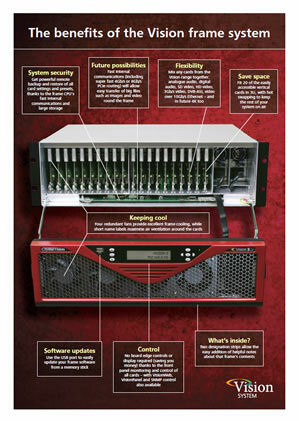 The Vision frame allows powerful remote backup and restore of all card settings and presets for added system security. This is made possible by the highly-specified frame CPU, with its fast internal communications and its large internal storage – and is a real benefit for big systems. Vision 3 automatically backs up every card’s settings and presets whenever they are changed. The settings files for automatic backups are stored on a slot by slot basis in a folder called ‘backup’ on the frame which is accessible by FTP. If the ‘Auto Restore’ option is enabled then these files are automatically resent to the card in the slot on power up, reset or if a card is reinserted. Using an FTP connection it is possible to copy the files from the 'backup' folder to a PC, rename them if necessary and then FTP them into the 'import' folder on the frame in order to use them for the manual restore operation. Manual restore gives the option of using a single settings file from the import folder to be sent to one or more slots. This is particularly useful for initial setting up of multiple cards which need to be configured identically, as only one needs to be configured and then can be applied to the others. The frame itself automatically creates a backup file whenever its configuration is changed, such as network or slot labelling. Large storage options on the frame CPU allow the sharing of images and other data – ideal for our future graphic-based products. Storage is available in different sizes, from the Flash on the CPU, to a plug-in SD card or SATA SSD drive – providing a suitably-sized storage option for every application. Very fast communications between the frame CPU and the cards, and from card to card, will allow easy transfer of big files such as images and video around the frame. This is due to the physical proximity (the CPU plugs into the backplane, directly underneath the boards) and to the fast internal routing, with one lane of super fast 4Gb/s PCIe routing is supplied as standard, with the option of upgrading to a second lane for even faster transfer. Contact our support team to request the latest software for your frame. Tell us what you want to achieve with your system - our product experts will work out the best way to do it!